We don’t mean to toot our own horn, but we’ve got the best saxophone teachers in town! These deeply expressive woodwinds take a lot of skill to play. To succeed, you need a skilled music teacher and a supportive school to get from those early squawks into beautiful music – whether it be jazz, blues, classical or rock. Elite Music Academy prides itself on well-rounded music education, ensuring that our students get exceptional lessons and opportunities to progress as a musician. We provide a trial lesson to get started so you can meet the teacher first before registering. As a performance-based music school, we arrange opportunities for students to perform at popular venues around Toronto. Our music school also has two large Winter and Spring recitals in a professional theatre. Regardless of whether you play sax or clarinet, kids ages 10-17 are welcome to join our Rock Band course to gain experience playing in a group and developing musicianship. Saxophones make a great addition to our summer Toronto Music Camp, where kids and teens learn how to play in a band and make music videos. We don’t mean to toot our own horn here, but whether your ambition is to play in a jazz ensemble or Honk Fest, Elite Music Academy has you covered with exceptional teachers and prices. Learn jazz, rock, or classical music. All ages and skill levels welcome. Book a trial music lesson. No obligation to register. Have questions? Meet the teacher first and try a single lesson first. 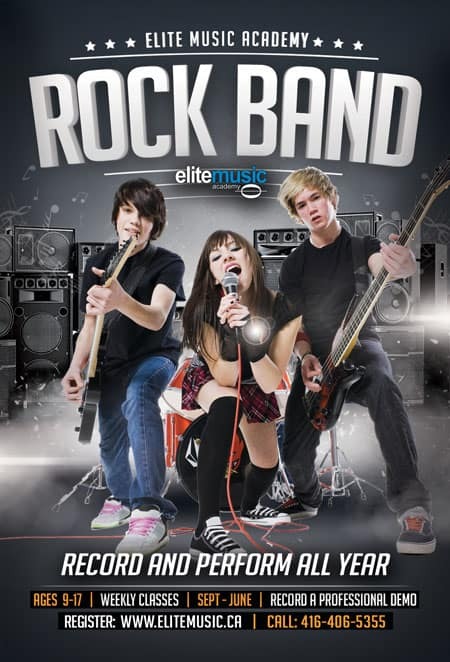 Our Music Camp and Rock Band is perfect for sax players. Perform on stage at our school concerts. Record with our sound engineer. We’ve got super lesson fees and policies and we’re open 7 days a week. Our music studios are clean, welcoming, and run on time! With Toronto’s Greatest Sax Teachers! Tell us about your musical goals for sax! 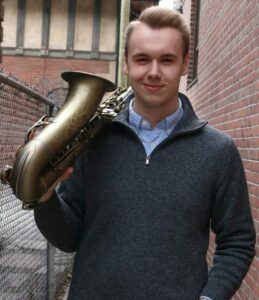 Dermot is a saxophonist and University of Toronto student who regularly performs with jazz orchestras and small ensembles, having also founded and co-directed his own big band while at Berklee College of Music. Dermot has had a variety of studio recording and teaching experiences and regularly performs with musical theatre pit orchestras at the University of Toronto, playing all four saxophones, clarinet, bass clarinet, oboe, english horn, and flute. Regular Students Save Money. Casual Students Get Flexibility. 1. A talented saxophonist is hard to find these days. You’ll always have a job. 2. Saxophones are versatile for jazz, soul, classical, and marching bands. 3. You could play in a hipsteresque, street band at Honkfest! 4. There are 9 different sizes of saxophone to suit people of all sizes. 5. It’s social! Wind instruments sound better when played in a group. 6. Harder to learn than piano or guitar, you’ll learn patience and perseverance. 7. Wind instruments are light, portable, and don’t require amplification. 8. Physical benefits: improve your lung capacity and abdominal/core strength. 9. The brain health benefits of taking music lessons are endless. 10. Look cool. Just add a pair of Ray Ban shades and a jean jacket. Does your music school have recitals or shows? Yes! We’re a performance based music school! You can also toot your horn at any of these open mic venues on The Danforth. How do I find the best sax or wind instrument teacher? We’ll provide you with a trial sax lesson. Here’s 6 things you should consider when shopping for a woodwind teacher. Is it true that it’s never too late to learn saxophone? Adults face different challenges than kids when taking sax lessons for the first time. Here some great tips to succeed. Do you rent saxophones, flutes, and clarinets? Unfortunately, we don’t rent wind instruments. However, we can special order them for you at rock-bottom prices. We will beat any price for the same model sold in any Toronto-area music shop.